Amongst the many mundane e-mails that i received on Wednesday was one from Society fellow Adamski. It simply read, "Hopefully attached are the ramblings of a madman". Unbeknown to me, Adamski had minuted the previous night's meeting. What follows is all his own work. Thankyou Sir! Persons present: @936ADL(AL)(Chair), @SJ1202(SJ), @ObsessiveJohn(JS) , @AlScott(AL), @DaipacCycling(DL), @MaxWhite65(MW), @MartynbroVVn(MB), DangerousBrIan(IS), @woodsdrycleaner(AC), Sanjay(father of @SJ1202), Tat. Apologies. - None. Society members never ever apologise. The pre-meeting off road ride was preceded by the Inaugural Shifnal Cycling Society best dressed bike competition. The children of the Chair voted JS bike the winner. The society congratulated JS and commiserated with members who missed the judging area. DL proposed we all buy Obsessive Compulsive Cyling Disorder, available from Amazon and more legit retailers. DL then gave us his top 50 books. AS, JS, AC, and SJ all pointed out that DL admitted he doesn’t like reading. It was agreed not to purchase the book. AC suggested that the SCS put forward a team to enter the Shrewsbury Grand Prix. The Chair raised concerns that the ability of our potential team may not reach the high standards associated with this historical event. SJ wanted to know where the event would take place, JS mentioned the clue in the name of the event. Once AC pointed out that the event would welcome participants of varying cycling standards it was almost ready to be put to vote. Before it went to vote DL challenged AC that his pronunciation of Shrewsbury was incorrect. The next one hour of the meeting was very difficult to record. The Taming of the Shrew, beau, small welsh town, in or out of the city walls, town coat of arms and many more phrases and words were thrown across the table. JS asked Marika, one of our bar girls, to decide which pronunciation was correct. AC objected strongly that Marika was unqualified to decide. The Chair agreed, but far more quietly. The matter will carry on until the next AGM, the SCS did not confirm the club position on Shrew/Shrow. AS mentioned he would like to ride 100k off road. The Chair agreed to do this with him in 2014. The society will undertake a coast 2 coast ride in July. A date for the Wales top to bottom has yet to be decided. AC suggested we get some horses to see which the faster mode of transport is. I can’t remember if The Society agreed or not to purchase a wine bar in Shifnal. It was agreed by all members to look into a Society van. JS knows someone round the back of ASDA that could paint it. MB pointed out we would need a driver. SJ was elected treasurer. His Dad on hearing this news left very promptly. AS and AC are going to set up a base camp in the Yorkshire Dales in readiness for Le Tour. AC is to segment the BMX track. He can’t remember how. AS suggested we head up there after the meeting. We agreed not to. The meeting ended when the beer stopped flowing. We all agreed it was a most excellent meeting. The picture above is little more than a collection of numbers, and none even come close to doing this ride justice. A truly awesome day on the bike, all devoted to the purity of the SingleSpeed and the pursuit of an imperial century. Originally hatched as a plan between myself and @NovaRaidersCC’s @Middy_Middy, the objective was a simple one. Ride one hundred miles, on one single gear. We set a date, bizarrely in December, and I planned a route. Shropshire’s flatter northern territories were ideal; nice fast roads, and nothing too nasty in the way of hills. One of our newest SingleSpeed recruits, @DaipacCycling, threw his casquette into the ring, and so on the day, there was three. Riding to the pre-arranged start point I was nervous. I’d an idea of my riding companion’s pace, and I was a little worried. I was just hoping that we’d all be able to stick together and enjoy the ride. The early miles passed easily, and spirits were high as we got to know each other. Stories and anecdotes were exchanged, and the pace was healthy. Push on was the consensus, and after riding some of my favourite Shropshire roads it was time for a coffee and cake stop in Ellesmere. Leaving the Café, December made its presence felt and we were glad of the climb that followed to get some warmth back into legs. The metric century was passed, and I was feeling good. We each took our turn on the front and the strong pace was maintained. 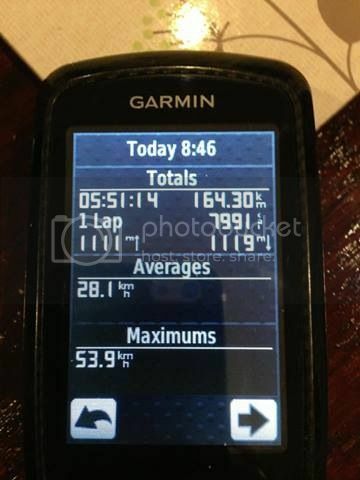 @Middy_Middy’s view was that the ride was really finished at the 80 mile marker. His rationale being that the last 20 were a breeze after you’d completed 80. I liked it, and as we passed the ‘finish line’ my spirits were high with only just over an hour to go. As with so many great rides, this one had a sting in its tail and this one’s known locally as the Abbey Road. Running from Lillieshall up towards Heath Hill, it’s a pig of a road, even more so on a SingleSpeed. The final ramp is a real killer, but at the top I was greeted by a real sense of euphoria. All that remained was a roll off the hill to complete our goal for the day, and I think it’s fair to say we’d managed it in some style. An absolutely fantastic day’s ridiing, in great company. When are we going to do it again?